For more than 20 years, Peter Moses has performed for groups of young children, festivals, libraries, schools and major children's music venues. These include a sold-out Keswick Theatre, the 1999 Governor'sChildren's Celebration, The Lancaster Festival of the Arts, Welcome America and World Café Live in Philadelphia. Peter's concerts are highly participatory, funny and upbeat. 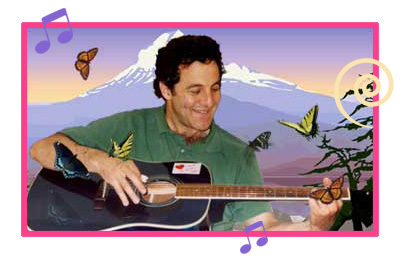 Performances combine interactive singalongs with original folk & pop-rock for children. He accompanies himself on guitar, keyboards and harmonica. Peter has produced ten original music and song titles since 1990. His full-time endeavors include directorship of The Music Experience. This is a national project of music enrichment for preschools and daycare centers. Peter is cofounder of The Hunger Council, a locally based nonprofit group for hunger relief and charitable projects. He is also a seminar leader offering practical and inspirational workshops in "Great Music, Movement, Rhythm Reading & Song", "Stress Management Plus" and "Teaching & Parenting Emotionally Healthy Children". For more information about performance bookings, children's music recordings or for details about workshops, call us toll-free at 800-350-9504 or email us.